How to Delete the Windows.old Folder in Windows 10? After upgrading to Windows 10 without doing a clean install, you will find there is a Windows.old folder which takes up too much space. Then, how to delete Windows.old folder in Windows 10 safely to free up space? First of all, you should have an exactly concept about Windows.old folder. The Windows.old folder is a folder in system partition (typically C: drive) to save the previous version of Windows system when you upgrade your Windows to a new one without formatting your hard drive or doing a clean install. The Windows.old folder contains previous Windows, program files, and all the data of Users. It was first introduced by Windows Vista, also applies to Windows 7/8/8.1/10. Thus, you can use this folder to do Windows rollback. For example, you’ve upgraded your Windows 7 to Windows 10; you can also revert back to Windows 7 with the Windows.old folder. So restore your system to the previous version of Windows if you dislike the new one. By the way, you can also restore some individual files from the Windows.old folder. Windows.old folder will be deleted automatically after a month you upgrade. So if you don’t like your new Windows interface or functions, you can restore to your previous version of Windows. Please note that you cannot restore system from Windows.old folder after a month you upgrade, unless reinstall Windows. Why Delete the Windows.old Folder? There are some annoying problem that the size of Windows.old is too large, the system partition is filling up, so how to delete Windows.old folder in Windows 10/8/7? The answer is easy. Before you removing Windows.old after Windows 10 upgrade, please backup system and data for Windows 10 recovery in case of unexpected system failure and other errors. 1: Download AOMEI Backupper Standard and launch the program. On the main console, select “Backup” at the left column. 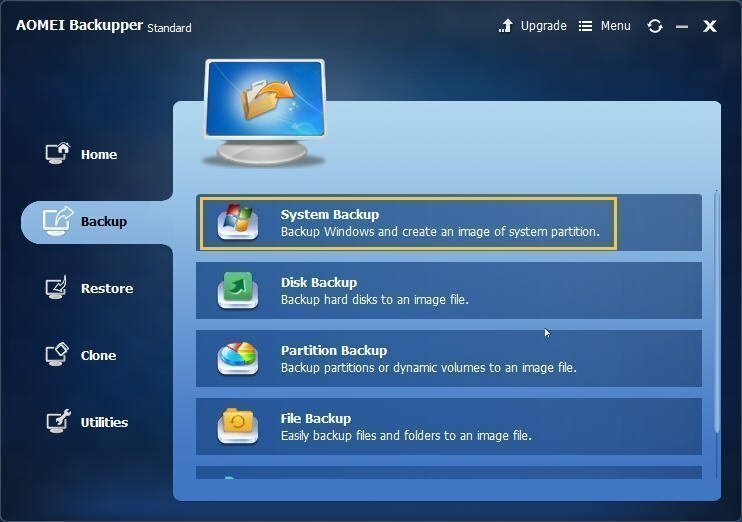 2: You can click “System Backup”, “Disk Backup”, “Partition Backup”, or “File Backup” according to your needs (here is “System Backup”). 3: In next window, enter a name in “Task Name” box (here is System Backup). Then select destination disk to save the image file in the “Step2” (here is F partition). Then, press “Start Backup” button to backup Windows 10. 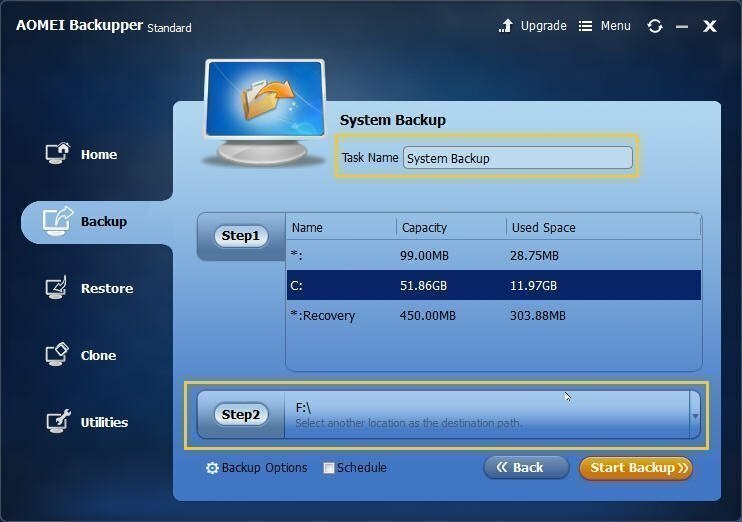 In the “Step1”, AOMEI Backupper will detect the system partition, the system reserved partition and system recovery partition automatically, so there is no need to select manually. You can configure the image with Backup Options and Schedule if necessary. In the “Step2”, you can also choose an external hard drive, a USB flash drive, a NAS device or a network share as destination. AOMEI Backupper also provides system restore, disk clone, partition clone, create a bootable media etc. It’s a powerful backup software for Windows 10/8/7, which is highly recommended by its users. You may remove Windows.old folder after Windows 10 upgrade to free up space for C drive if you want to stay with Windows 10, then the C drive will generate more room. Delete Windows.old folder won’t be easier than remove the normal files, because the system regards the Windows.old folder as a system folder. So maybe that’s why you encountered the situation cannot delete Windows old folder. Tips: In case of you need the Windows.old folder later, you can backup Windows.old folder before deleting it. The following steps are about how to delete Windows old folder in Windows 10 without data loss, here are two solutions. 1.Enter “cleanup” to Windows 10 search box, select “Disk Cleanup” in the list of results. 2.In the next pop up window, select your system partition and hit “OK”. 3.Wait a moment, on the “Disk Cleanup” window, click “Clean up system files”. In the next window, select system partition to continue. 4.Scroll down the scanned file list; tick “Previous Windows Installation(s)” option only, then hit “OK” to start clean up. 1.Press Windows + E to enter the File Explorer. Click “This PC” at the left panel. 2.Right click the C drive under the “Devices and drives”, select “Properties”. 3.In the next window, click “Disk cleanup”->”Clean up system files”. 4.Select “Previous Windows Installation(s)” only, then press “OK” to start cleanup. You can delete other related files by your own needs. After these operations, you have deleted the Windows.old folder successfully in Windows 10 without data loss so that you can get a better performance in your computer.